Premium Beef, locally grown by select ranchers. 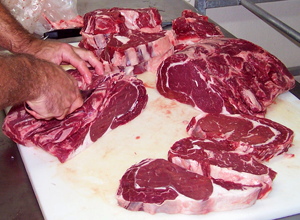 Buy the whole or half cow, Butchered and Processed by Cutrer's for the best possible quality. An owner tags and weighs your animal, and it is processed, butchered and packaged individually, one at a time. Your meat is never mixed with anyone else's. All meat is cut or ground fresh, double wrapped and flash frozen, to lock in freshness and flavor. You get the best flavor and most tender meat. Our Flash Freezing Process provides meat that will last 3 years in your freezer with NO Freezer Burn. Your meat comes out fresh and tender.